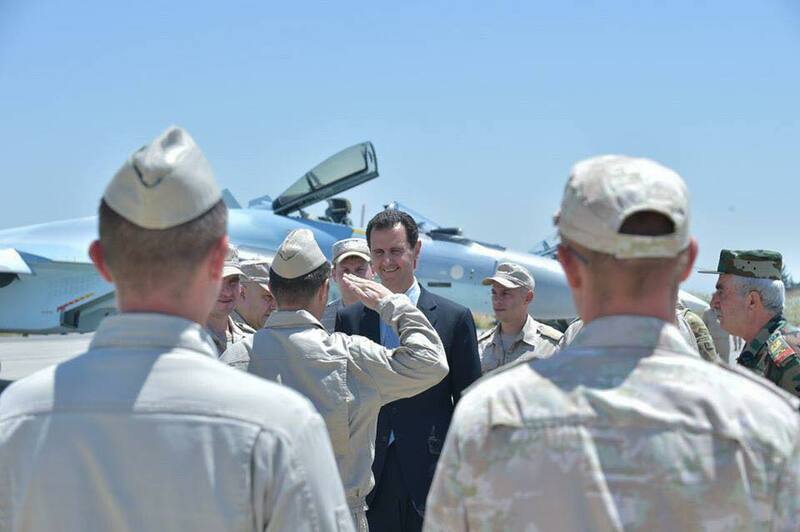 London- On the sidelines of his visit to Hmeimim military air base, where Russian air forces are based, head of Syrian regime Bashar al-Assad stressed that he will never forget Russia’s support for him in the Syrian war. “Russia has provided weapons and ammunition to support Syria in its war against terrorism, but more importantly it has offered blood as well, which is the dearest thing a human being can give to fellow humans,” Assad said, according to Sputnik news agency. This is the second time Assad tours outside Damascus, where he had delivered the Eid prayer in the city of Hama, located in central Syria, whereas the Hmeimim base is located in the province of Latakia east Syria. He visited Hama after the Russian army bombed the countryside of the city and weeks later after attacking Khan Sheikhun with chemical weapons, which Washington responded to by bombing the regime forces.